Dual capnography can be achieved by using two end-tidal CO2 monitors to analyze CO2 wave forms from each lumen of a DLT.1 Since using two monitors to measure ET-CO2 in the operating room may be inconvenient and not practical, a device as suggested by Bhavani-Shankar et al,2 can be used as shown in the figure. It has a three way stopcock with connections to the two CO2 sampling adapters that are interposed between each lumen and its corresponding limb on the Y-double lumen tube adapter. This allows gas sampling from either each lung or two lungs simultaneously. The standard method of PETCO2 sampling via DLT (capnograms of individual lung obtained via interruption of ventilation to contralateral lung) can also reveal the ventilation/perfusion status of lung. However, dual capnography allows one to assess the ventilation/perfusion status of each lung in individuals who cannot tolerate one-lung ventilation long enough to reach a new steady state. 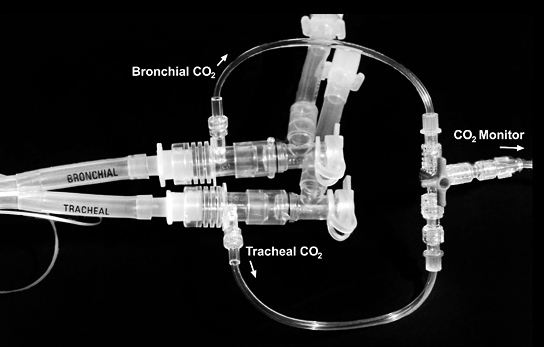 In the absence of a DLT, a FOB (fiber optic bronchoscope) can be used to obtain PETCO2 samples from each lung.3 This technique allows one to assess the ventilation/perfusion status of each lung in patients with or without an endotracheal tube. Although there is no published comparison of this approach and standard dual capnographic techniques, this method, at least theoretically, may be useful to determine the PETCO2 of expired gases from each lung. It is possible that bronchial sampling via FOB from one lung could be contaminated with expired gases from the contralateral lung, particularly when expired flow rate decreases to less than 150 ml/min (sampling flow rate of capnograph). Such contamination, however, could be detected by the shape of capnograms. Contamination is an unlikely factor in the presence of a normal shape of CO2 waveforms from each lung.4 Therefore under these circumstances, a difference between the heights of the alveolar plateau of CO2 waveforms from each lung suggests a difference between the V/Q status lungs. One of the advantages that is inherent to capnography is that it is a non invasive continuous monitor. Correct placement of double-lumen tubes can be checked by analyzing the CO2 wave form from each lung and also during clamping and unclamping procedures of each lung. Further, the CO2 wave forms can be examined periodically from each lung. A change in end-tidal concentration or CO2 wave form could give early warning of a misplaced double-lumen tube or inadequate ventilation and CO2 elimination from the lungs. 2. Detection of perfusion defect-secondary to thromboembolism, tumor, hemothorax:- Bhavani-Shankar et al3 have reported a case where a patient scheduled for right sided pneumonectomy was unable to tolerate OLV due to hypoxemia and arterial blood gas analysis showed a large PaCO2-PETCO2 gradient. A dual capnography revealed the PaCO2-PETCO2 gradient more than two fold greater in the left than in the right lung. Surgery was restricted to pleurectomy and a further work-up later via echocardiography and pulmonary angiogram confirmed the presence of a large thrombus in the left pulmonary artery. from these findings that there was no major blood flow limitation in the left main pulmonary artery. Confirming this hypothesis was a subsequent intraoperative Doppler study which showed that the left pulmonary artery was indeed patent with normal flow velocity. 3.Other uses includes- To explain abnormal wave forms on capnograms. Example: Biphasic capnogram wave forms are seen in patients with single lung transplant.6 Dual capnography would have confirmed the etiology of biphasic capnogram as it could have isolated the capnograms of each lung thereby showing the individual characteristics of respective lungs. 1. Shafieha M.J, Sit.J, Kartha.R et al- End Tidal CO2 analyzers in proper positioning of the double lumen tubes. Anesthesiology 1986; 64: 844. 2. Shankar K.B, Moseley H.S.L, Kumar A.Y.- Dual end tidal CO2 monitoring and double lumen tubes. Can. J. Anaesth 1992; 39: 100-1. 3. Shankar K.B, Russell Roger, Aklog Lishon, Mushlin Phillip- Dual capnography facilitates detection of a critical perfusion defect in an individual lung. Anesthesiology, Vol 90 (1), Jan 1999, 302-304. 4. Brampton WJ, Watson RJ. Arterial to end-tidal carbon dioxide tension difference during laparoscopy. Magnitude and effect of anaesthetic technique. Anaesthesia. 1990 Mar;45(3):210-4. 5. Russell R, Bhavani Shankar K, Mushlin PS. Another application of dual capnography. Anesthesiology 2000; 92:1:288-9. 6. Lynne Williams, W.Scott Jellish, Paul A. Modica et al – Capnography in a patient after a single lung transplant. Anesthesiology Vol 74, No.3, Mar1991, 621-622.